Medium Dark Roast Coffee and Chicory. 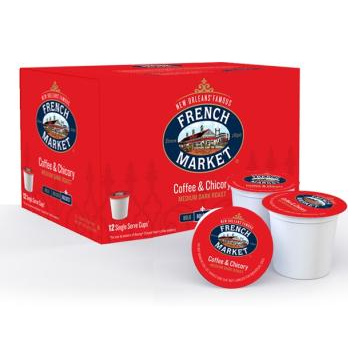 French Market's Coffee and Chicory Medium- Dark Roast Single Serve Cups are 2.0 compatible and you get 12 pods per a box. French Market's Coffee and Chicory is made from 100% Arabic coffee beans that are brewed in small batches and French Imported Chicory is added to the mix to get a bold and bittersweet flavor. A New Orleans favorite!